Now that's a name I've not heard for a long time. 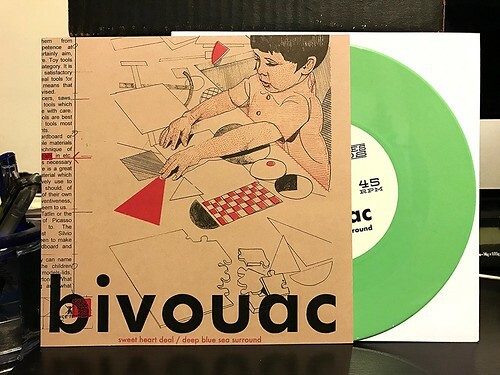 It's been twenty years since Bivouac have released a new record and like many other bands from the 90's, I guess the time just seemed right to get back together. This is a trend that I will never get tired of. I encourage all of the bands that I liked in the 90's to get back together. Someone keep me posted on Alligator Gun's status, OK? This Bivouac 7" contains two new songs. The first, "Sweet Heart Deal," is a fast paced and pretty straightforward rocker that picks up right where the band left off. They've always had those big, chunky guitars and the slightly gruff, but melodic vocals. As the song moves along, the drumming feels a little one dimensional and the snare drum in particular seems to be getting an unnecessarily consistent smacking, but that one complaint aside, it's still a pretty great song. Things slow down on the B side "Deep Blue Sea Surround." The story goes that the song on the 7" is a reworking of a demo that the band was working on twenty years ago for a third full length that never quite panned out. It's a gradual builder with good dynamics and a satisfying payoff. All in all I'm very pleased with this 7". It certainly blows the doors off of that China Drum 7" that came out a few months ago. If you're looking for a slice of punky UK rock, this is definitely worth a listen.